The time has come again for me to venture into strange and wonderful video games that I never played as a child. 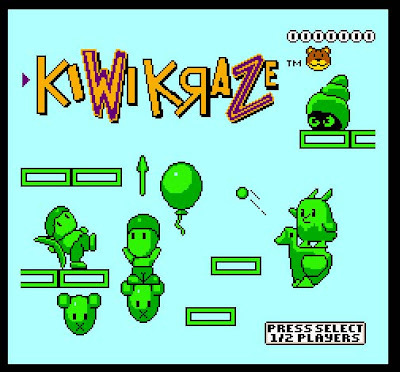 Today's pick: The New Zealand Story, also known as Kiwi Kraze. 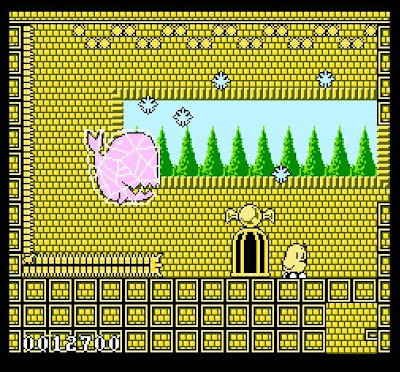 I can vaguely remember seeing a flashier version of this game in arcades way back when. And given my proclivity for all things New Zealand, you'd think I would have bothered to plunk in a few quarters. Not so. 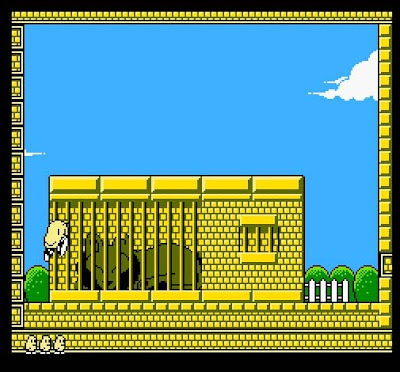 However, I found an emulated version of the NES port of the game at Nintendo8.com and decided to give it a shot. 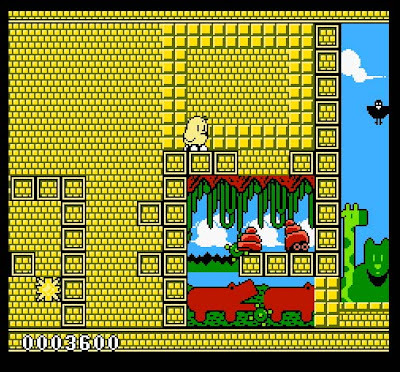 After all, this game was made by Taito, which also produced a more familiar and more popular video game, Bubble Bobble, the characters from which later went on to appear in Snood-inspiration Bust a Move. All that, plus a heroic kiwi bird protagonist? How bad could such a convergences of quirks be? 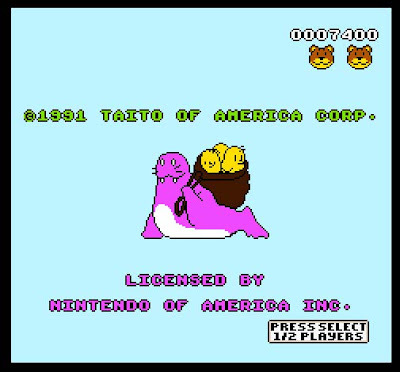 Based off this title screen, pretty damn bad. The hell? What is that font? 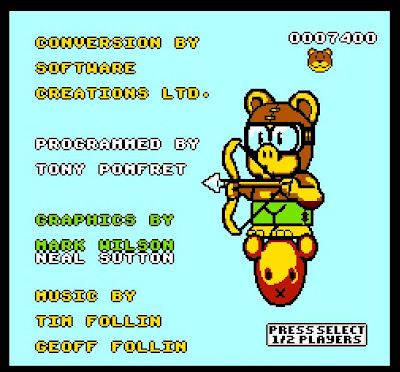 What is with the strange grinning bear face under the top score? 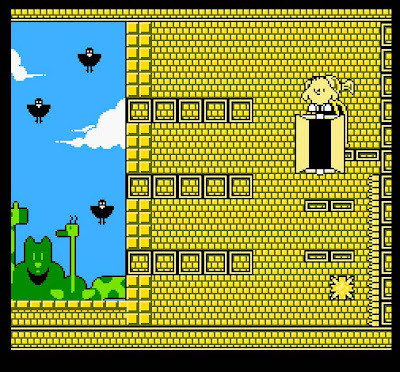 And what, for the love of God, are all those green monsters? Not one looks even remotely like a kiwi or anything remotely New Zealand. It's not the other kind of kiwi that I'm meant to play as, is it? This, friends, does not bode well. Maybe if I watch the attract mode a little while longer, this will get better. A be-goggled bear firing an arrow and riding on the floating disembodied head of another bear. And those names? Not a single Japanese one in the bunch. Wikipedia tells me that this warlus-looking fellow is actually a leopard seal — a carnivorous species that actually does live in New Zealand but doesn't, to my knowledge, eat kiwi birds. Yet nonetheless Mr. Purple Leopard Seal appears to have stuffed a gaggle of kiwis into a sack, surely not for benevolent purposes. As the heroic kiwi, it's my job to rescue them, one by one. Okay, I apparently misspoke when I called the hero a kiwi bird. 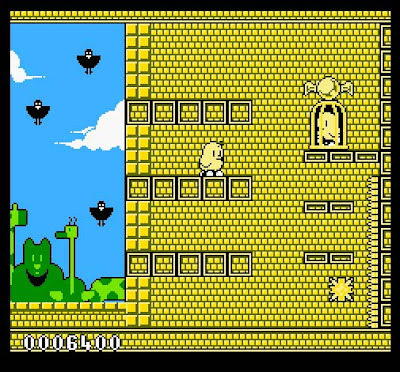 The limitations of eight-bit video game technology — or, perhaps, the designer's understanding of what a kiwi bird looked like — have resulted in the controllable character looking more like a standard farm baby chick. And what that sleeping olive-colored beast in the cage is supposed to be is completely beyond me. Am I in a zoo or a children's playroom? Without knowing the answer, I'll push my little kiwi onward, past the hordes of villainous conches, which periodically spit out green globs of goo. Having never encountered wild conches, I'll have to assume this trait is taken directly from real life and that said goo does, in fact, make you die instantly. Ack. Apparently the leopard seal has also employed strange British police officer-style minions, which, of course, toss boomerangs. 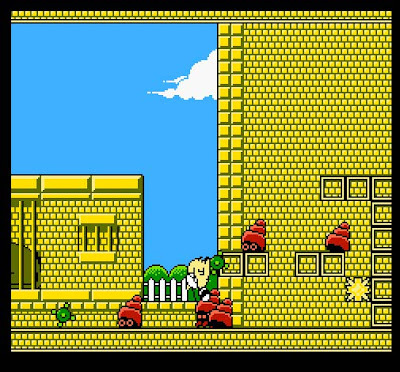 The various stereotypes of the British colonies have been melded into a single, mindless, generic video game enemy. Tragically, the game employs the one-hit-and-you're-dead rule, a vestige from the arcade days when people were being duped out of their quarters and tokens. On a home console, it's more frustrating than anything else. An exit! And a baby kiwi colleague! Can I be done with this now? With this part, at the very least. In all, that was rather painless. You know, except for dying. WHAT?! I'm actually in New Zealand?! Auckland, no less?! Jesus! They should have just called this Escape from Auckland. Had I realize that Auckland was full of all manner of projectile-vomiting mollusks and crazed colonial stereotypes, I would have never vacationed there. KrisDina, if you're reading this now, we're lucky to have escaped with our lives. I'm sure The New Zealand Story resulted in countless children developing negative impressions of little Australia Jr., which is why nobody ever wants to travel there today. 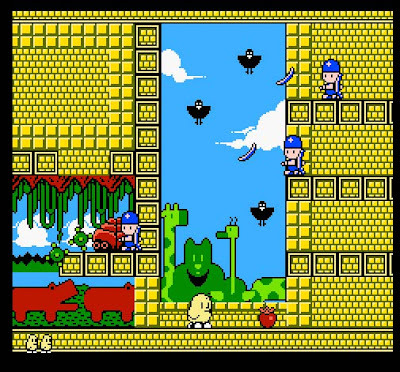 I don't know from experience, as this game's shoddy controls and tinny music angered me such that I never actually had the patience to get Mr. Kiwi Chick out of Auckland, but I'm told each subsequent stage is also based on a real-life New Zealand locale. (I'm assuming, however, that the stages represent this places in name only, judging that the Auckland I saw wasn't made entirely of butter yellow bricks.) The stages, in order, as as follows: Rotorua, Waitomo Caves, Wellington, Strait Cook, Hanmer Springs, and Mount Aoraki. Weird, to say the least. 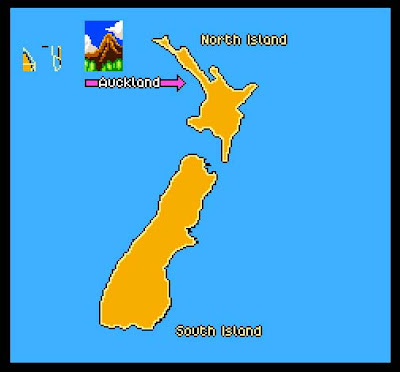 Bare minimum, I can presume that somebody actually looked at a map of New Zealand before retuning to de`sign more anonymously weird enemy sprites. Like I said, I got bored before I got out of Auckland, so let's pick up — and end off — there. 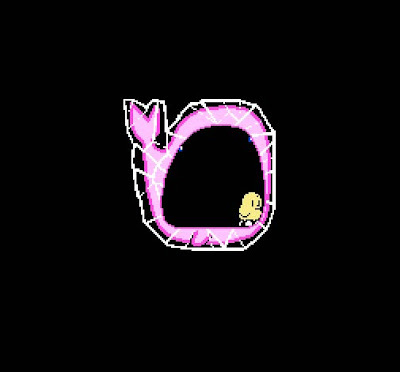 Mr. Kiwi was approached by what I can only describe as a floating, pink whale ghost wrapped in cellophane. Those snowflake-looking objects were coughed at him by the polter-whale, which Mr. Kiwi dodged long enough to be swallowed whole. And here he is inside the belly of the whale — the cellophane is easier to see now, please note. Mr. Kiwi must attack the whale's stomach from the inside, all the while dodging drops of stomach acid that rain down on him. Doing so proved difficult, and I never got to see the miraculous site that is an enraged Rambo kiwi bird bursting forth victorious from a dead whale's gut. As neat as that sounds, I've moved on. New Zealand Story, I'm done with you.